Different species of birds make different types of nests. Some birds, like American Robins, build twig and grass cup nests in trees. Others, such as barn and cliff swallows, make little cup nests from mud. And some birds nest in holes in trees. 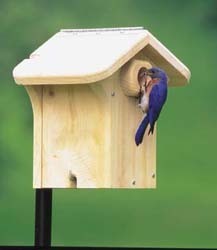 It is these cavity nesting birds that will use nesting boxes (a.k.a. bird houses). Cavity nesting birds are divided into two groups. Primary cavity nesters will excavate their own cavities in trees and snags. Secondary cavity nesters are dependent upon natural cavities and abandoned sites excavated by primary cavity nesting species. Both primary and secondary cavity nesting birds will use nest boxes. Home > Birding > Which Species Use Birdhouses?